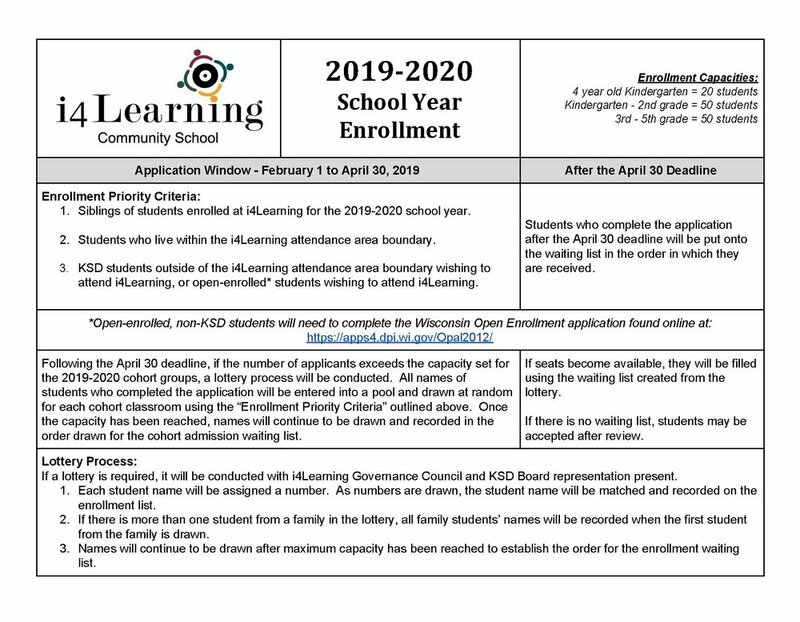 Registration and application to attend the i4Learning Community School is possible for the upcoming school year if there are spaces available, please refer to the enrollment chart below. Click the Application & Registration link below to initiate the enrollment process. Students with Individual Education Program (IEPs) are welcome at the i4Learning Charter school if it is the Least Restrictive Environment in which the IEP can be implemented, as determined by the IEP Team. If the number of applicants exceeds available seats, a lottery will be employed. Priority will be given to students who live in the i4Learning attendance area, or have siblings who attend i4Learning Community School. If you live outside the Kewaskum School District, you will need to contact the KSD office for open enrollment information. Open enrollment forms are usually available near the end of January for the upcoming school year. Additional information on open enrollment can be found on the Wisconsin Department of Instruction (DPI) website.